A GREEN Leadership Series event hosted by Tecom Investments’ EnPark had 150 delegates listening as panelists addressed the potential challenges that public-private partnerships, international investors and financial institutions can experience. The panelists suggested practical solutions centering on the development and adoption of policies designed to inspire green growth and sustainable development. 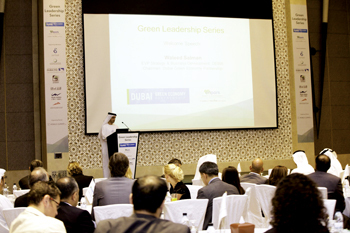 Established in May, 2012 by Sheikh Hamdan bin Mohammed bin Rashid Al Maktoum, Crown Prince of Dubai and chairman of the Dubai Executive Council, the Green Economy Partnership aims to make Dubai a global gateway for green investment and trade by accelerating the transition of Dubai to a green economy across local, regional and international markets. As the first multi-stakeholder partnership to promote the transition to a green and low-carbon economy in the Middle East, the Green Economy Partnership is driven by global collaborative efforts including public-private partnerships to reduce carbon emissions in all activities from power and water to transportation and the built environment. Chairman of the Green Economy Partnership Waleed Salman, who is also executive vice president for strategy and business development, Dubai Electricity and Water Authority (Dewa), said: “The Dubai Integrated Energy Strategy 2030 aims to reduce energy consumption by 30 per cent and carbon emissions by over 5 million tonnes. Collaboration such as discussions in today’s session help bridge knowledge gaps and shape the agenda of future initiatives. For example, following our inaugural event in October, we established the region’s first World Green Economy Summit, the second of which will be held in Dubai in April 2015 in association with Dewa and World Climate Ltd. The executive director of Tecom Investments’ Science Cluster and founding member of the Green Economy Partnership, Marwan Abdulaziz, said: “This event is unique in bringing together industry experts from across the sustainability sector to discuss how to further the UAE’s green economy through identification of opportunities, analysis of trends and private sector participation in shaping future policies. EnPark, a member of Tecom Investments, is a free zone business park dedicated to fostering growth of the alternative energy and environmental industries by offering excellent real estate facilities and providing access to the Mena region with a view to helping diversify Dubai’s economy. The park offers businesses technical and community infrastructure facilities across Tecom’s portfolio of business parks. More than 50 companies, from clean-tech start-ups to energy multinationals, operate under EnPark’s licences. In 2012, EnPark was awarded the UAE Green Brand; earlier it was honoured at the Offshore Arabia 2009 Environmental Awards in the ‘Excellence in Environmental Projects and Products – Future Projects’ category. It was ‘Company of the Year’ at the Alternative Energy Awards in 2008 for its role in raising awareness about sustainability concepts in the region.